The Educational Leadership Mapping (ELM) tool is an organizing framework to help you make sense of where you are within the educational leadership “landscape”. 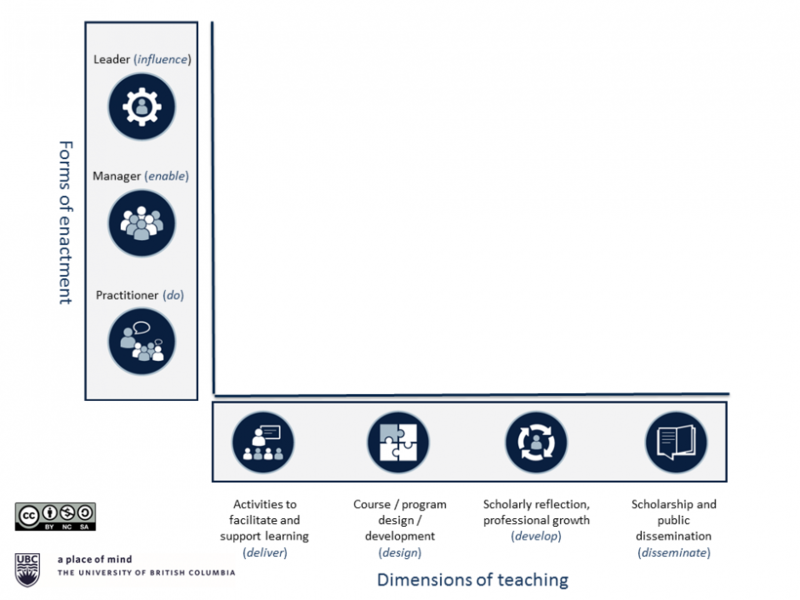 It can help you plot past and future journeys and contributes to a shared understanding across all faculty members (as, although educational leadership is a formal requirement in the Professor of Teaching stream, it not exclusively enacted by teaching-focused faculty). A conversation starter (about educational leadership, how it differs from service etc.). A planning tool (to support annual review, pathways towards promotion and tenure). A framework for building professional development activities around. A starting point for thinking about what the impact of educational leadership has been, and how that is evidenced. You can access the latest version of the map here. This Educational Leadership Mapping (ELM) tool is a simple two-dimensional framework, encompassing – from an individual’s perspective – things that you do related to teaching / learning and their forms of enactment. These two dimensions form the axes of the framework. Delivery. This refers to the broad range of activities that support and facilitate learning, including the time spent interacting with students in class, out of class, in office hours, seminars etc. The key feature is that activities that fall within this dimension are directly observable by students. Design. The design and development of opportunities for learning: Development and design of modules, courses, program and curricula. Generally not observable directly by students, but vital to the coherence of the educational offerings they receive. Development. The personal and professional growth from engaging in a process of reflective and scholarly teaching. This is part of an on-going process by which we understand, reflect on, and modify our approaches or attitudes to teaching based on interactions with colleagues, collaboration with other experts, from experience and reflection and from staying current with our disciplinary practices. Dissemination. The combined elements of scholarship and dissemination, making public the processes and outcomes of our reflective enquiry, experimentation and evaluation of teaching and learning innovations, activities and approaches. Practice. The practice of teaching and learning: what is done as part of the work of the individual. Management. The enabling of teaching and learning: the creation organizational conditions and execution of processes to support learning and teaching. There is a strong overlap with management and service contributions in the area of teaching (“doing things right”) and contributions to the work of a group, team or combined effort. Leadership. The leadership of teaching and learning: embedding notions of enhancement, innovation and change, with impact that extends beyond one’s own classroom. The activities undertaken to lead, influence and support others to innovate, enhance or change their practice or approach in any of these areas of teaching. The map is typically populated with different types of activities (over a period of time, relating to a specific project or role). The cells are not hard-walled and there is no expectation to ‘fill all boxes’.